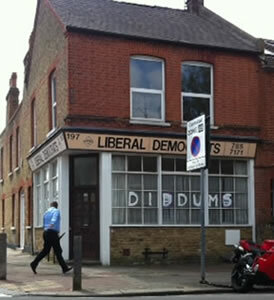 For the fourth time in less than 12 months the Lib Dem office on Felsham Road has received the white pain treatment with 'Diddums' across both sets of windows. In January it was a case of 'Blind Evil' - despite the installation of a CCTV camera aimed at the offices following the night time visits in 2010. 'Tory Fag' was the message in October 2010 & a month earlier the message was 'Fake'. - 30,900 pensioners have been given an extra £4.50 a week – and those retiring from today will be on average £15,000 better off over their retirement. Admittedly, we haven't been able to do everything in exactly the way we would have wanted - we have 57 MPs whereas the Conservatives have 306. Many of us would have liked 100% of the Liberal Democrat manifesto to be implemented rather than the 65% which is being brought about by the Lib Dems in coalition. It's very simple though, if you want more Liberal Democrat policies then you have to vote Liberal Democrat!"